Mediaraptor Free finds music videos and songs from social media websites. It can then record and convert the music video, or snag the MP3, depending on what it's found. It then converts them into the more portable WMV and MP3 formats, respectively. 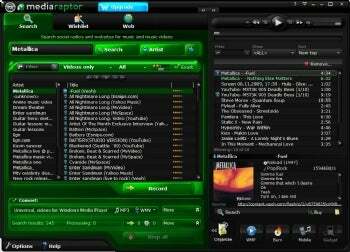 Mediaraptor Free can snag tracks from several social media sources, including MySpace. Also, if MySpace Video, YouTube or a number of other sites have a music video, Mediaraptor can grab that, too. Mediaraptor Free can grab music and videos from Metallica with ease. Unlike Tunebite Free and Radiotracker Free, two other products from Audials, Mediaraptor Free is pretty useful out of the box and not just as a demonstration of the full version. Though you can record only 40 files per session, there's no hard limit on the length of the converted file, and it can do searches for specific artists out of the box. Interestingly, the first tier of the paid edition, Mediaraptor Premium, actually removes searches for music videos and only allows you to search for music files or both music files and videos. The top-of-the-line program in the series, Mediaraptor Platinum, restores this feature. Unfortunately, there's a bit of legal ambiguity when using Mediaraptor Free. The app has the ability to track down MP3s that others have illegally posted to social network sites like Esnips.com. Though you didn't create and post this MP3, you're still not supposed to download it to your own PC, so keep that in mind. To stay on the right side of the law, stick to grabbing official music videos from places like YouTube and ignore the MP3 side of the app. One nice feature that works on both the video and music side is automatic lyric sheets. Mediaraptor will embed the lyrics in the file of any track or video it grabs--and these lyrics are viewable in Mediaraptor. It will also correctly tag the file with the industry standard ID3 tagging standard, meaning all of the information about the song will be correct. Recommendation: Use Mediaraptor Free to death, then when you're tired of the 40-track limit or want to convert to different file formats for your iPhone (for example), jump straight to Mediaraptor Platinum, bypassing the Premium version. Note: Mediaraptor Free can record up to 40 tracks or videos per session and convert them to MP3 or WMV, respectively. The full version of Mediaraptor comes in three tiers. Mediaraptor Premium can grab an unlimited amount of music from social media sites and video clips from places like YouTube for $27. Mediaraptor Platinum can perform targeted searches and multiple file format conversions for $40. Finally, AudialsOne is a suite of many products from vendor Audials for $60.